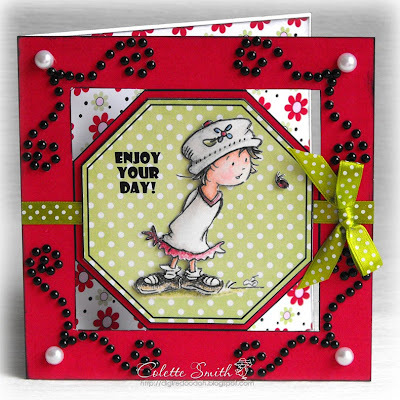 Hi, today; I have a card to show you using a Sassy Cheryl illustration, I decorated the card with grosgrain ribbon, buttons and waxed cord from Meiflower. I used a thin stripe of tacky glue to fix the cord into place on the card, you can draw your design with the glue, leave it a minute to go extra tacky and then press the cord into it. 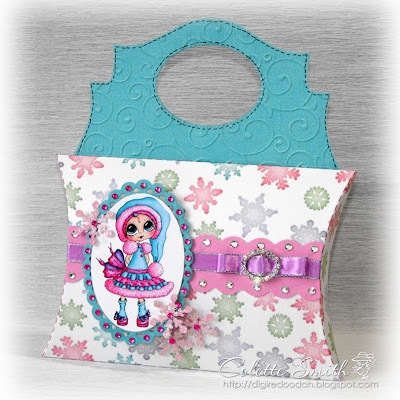 As a change from my usual cards or wedding invitations I have a gift box to show you today, it started life as a plain old pillow box, but with the addition of a die cut handle quickly became a handbag gift box. 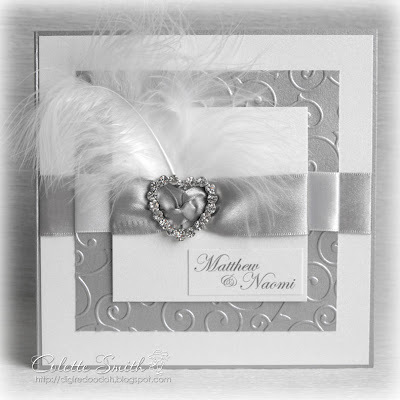 The pillow box part is almost A5 size so plenty big enough to carry a pretty gift. 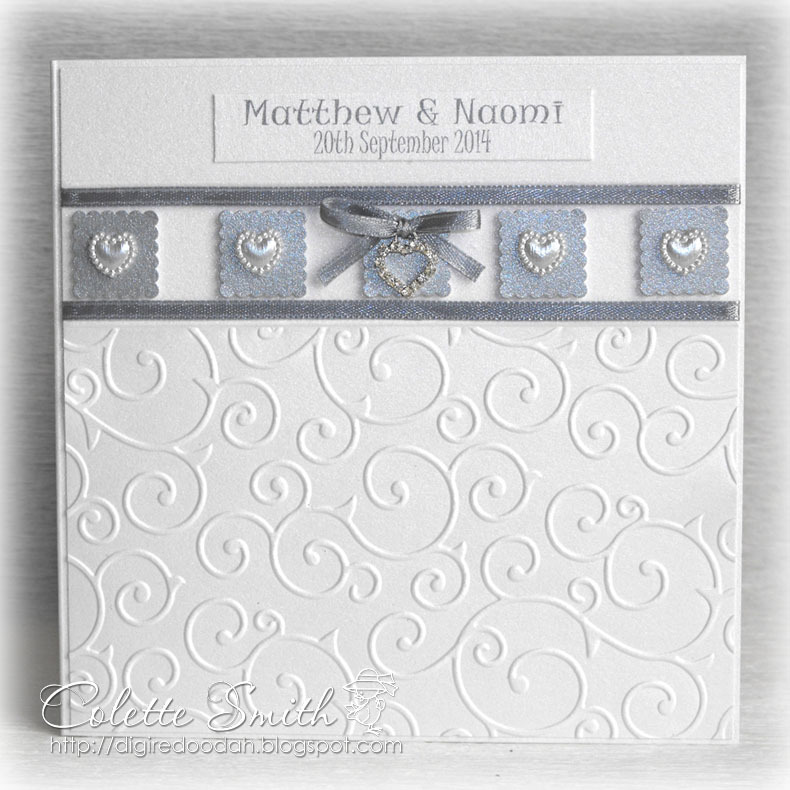 I added some of Meiflowers pretty metallic edged ribbon, a diamante ribbon slider and lots of stick on gems for extra sparkle. 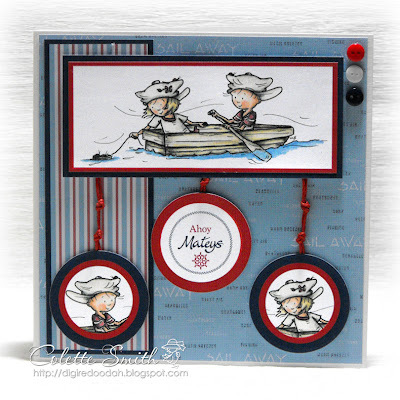 I always like to add a few knots to any type of nautical card I make and Meiflower's waxed cord is perfect for the job, especially as it comes in a great range of colours, so you can match it with your colour scheme. On this card I doubled the cord and tied a couple of knots in it and then fixed it to the back of the images to make them look like they are hanging from the main image. I also added a few of Meiflower's little buttons, which are also available in a great range of colours in both plain and polka dot. Still got a few more invitations to show you, six more after this one. 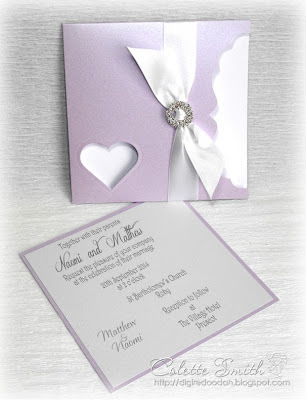 Todays invitation is a pocket with the details on a sheet inside that slides out. 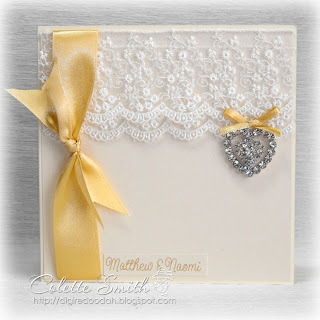 I used a frame die to cut the fancy opening and die cut a heart window for the bride and grooms names to show through. 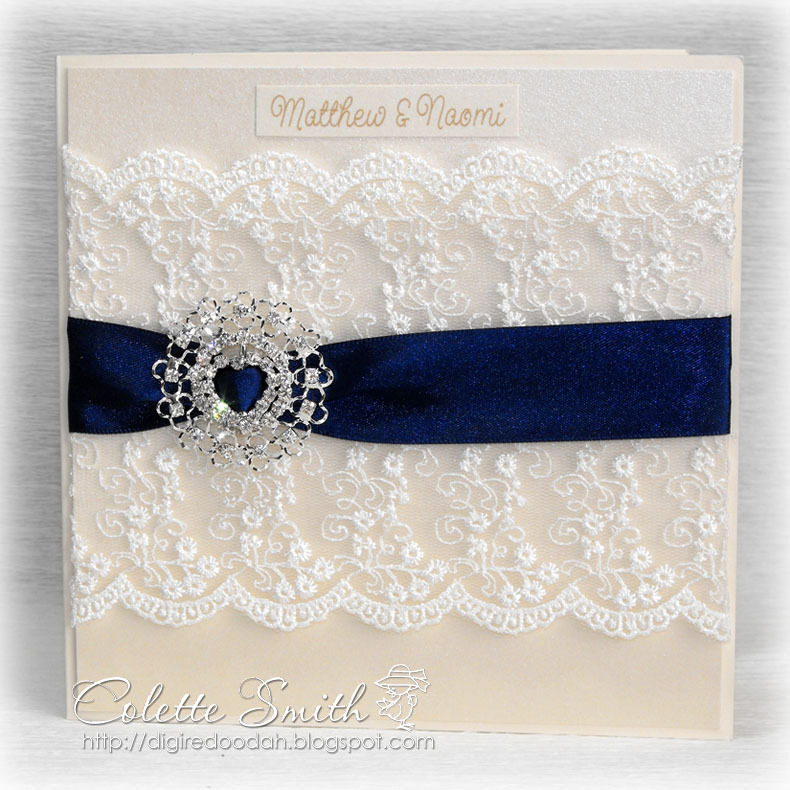 It's quite plain, but finished off with some wide satin ribbon and a gorgeous diamante ribbon slider both from Meiflower. 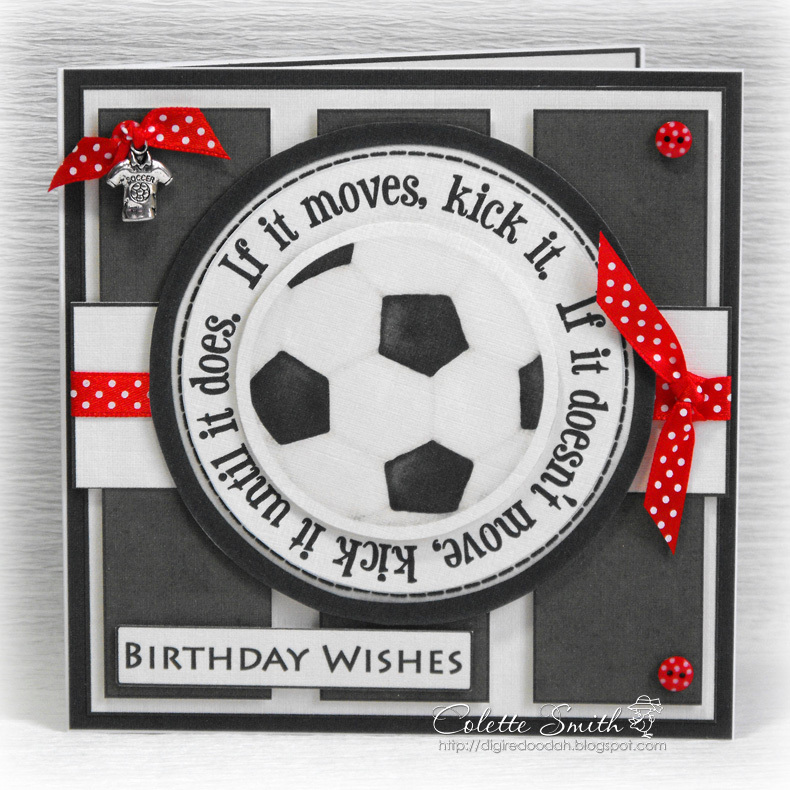 For today's card I have used a Paper Creator card kit, called Kick it, which is perfect for football mad boys of any age, I added Meiflower ribbon and buttons in appropriate team colours and a fab football shirt charm, also from Meiflower to finish it off. 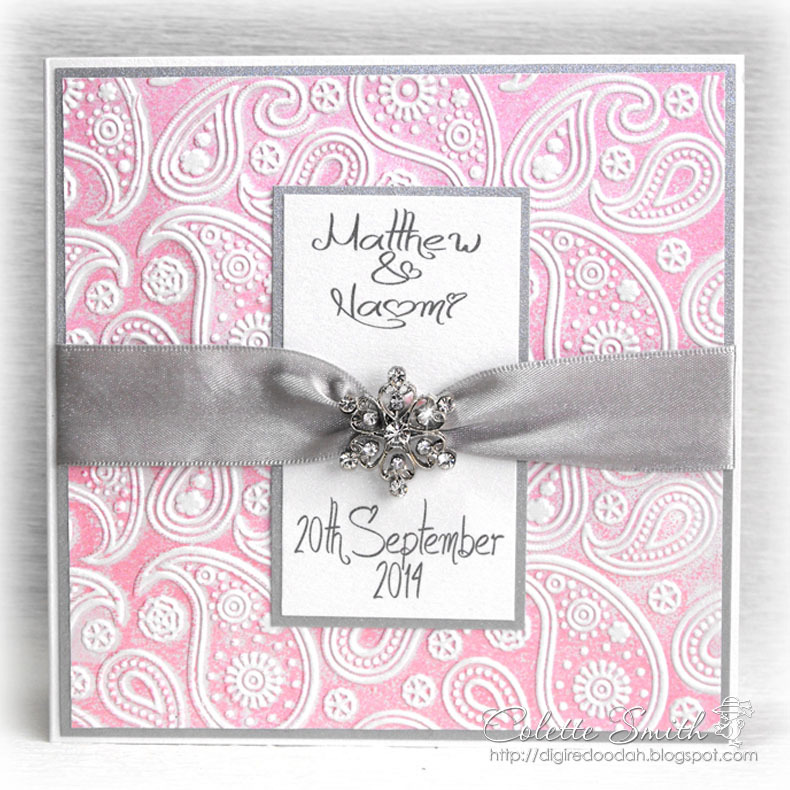 Yet another wedding invitation, on this one I made the paper myself by rubbing a pink ink pad over the inside front of an embossing folder, then adding pearl paper and running it through the machine, the ink goes onto the flat parts but the embossed parts stay white. I love the effect. It's finished off with some wide satin ribbon in a gorgeous silver colour and a pretty diamante topper both from Meiflower. 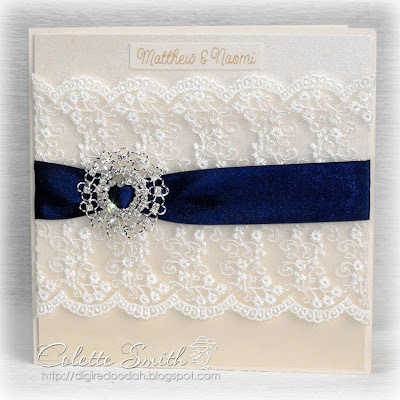 Another simple design today, although I didn't have lace that was wide enough so I used two layers, which made it a bit more fiddly, I also threaded the ribbon through two diamante ribbon sliders to make it a bit more blingy. 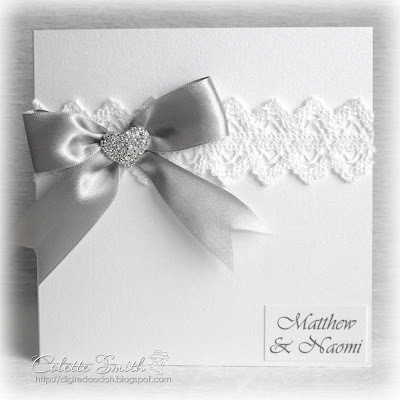 Today's wedding invitation is probably the easiest one of them all, just some lace, a big bow made from Meiflower wide satin ribbon and a beautiful diamante heart topper also from Meiflower. The lace is really pretty and has a glittery thread running through it that unfortunately doesn't show up in the photo. 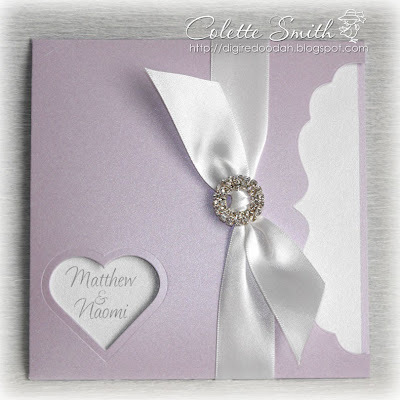 Once again this one is not too difficult, just some different sized squares of card, one embossed, brought together with wide satin ribbon and a diamante heart ribbon slider from Meiflower. I added the feather because I thought the top looked a bit bare, but you could always print the names above the ribbon, the date or other details below and leave the feather off completely. A much easier one today, just some embossing and punched squares, with narrow ribbon, pearl heart embellishments and a diamante heart charm all from Meiflower. This design is a little more complicated than some of the others, so would take a lot longer to put together, wouldn't be too bad for a small wedding with not too many invitations. 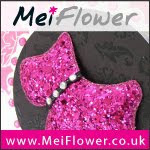 It's decorated with some lovely pearl embellishments from Meiflower. The pearl and diamante flower topper is soooooo pretty in real life. Today I have two cards to show you, both using Sassy Cheryl images and featuring Ladybirds. 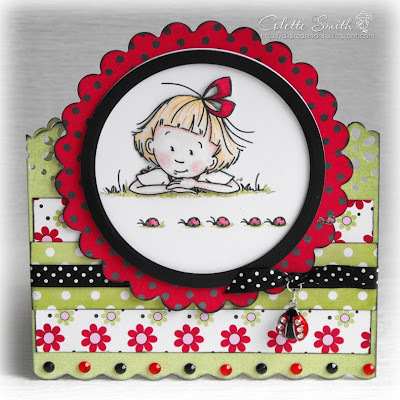 I have used papers from the same digital scrap kit for both and added ribbons, pearls, gems from Meiflower to both, I also used a gorgeous Meiflower enamelled ladybird charm with diamante spots on one as well. See you Tuesday with another wedding invitation. A very simple design, made more spectacular by the layers of gorgeous deep lace and the double diamante heart, made by sticking a heart ribbon slider and diamante heart topper together. Some wide knotted satin ribbon and a matching narrow satin ribbon bow add a contrast of colour. I'll be back with another over the weekend. 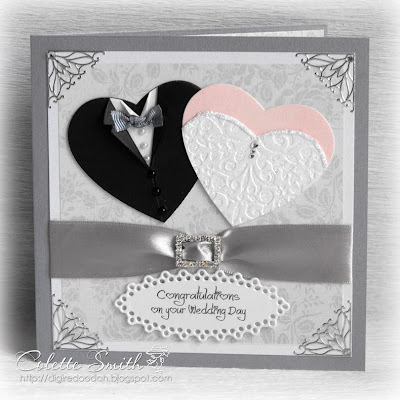 Still on the wedding theme but this time around a wedding day card, the bride and groom toppers were made by layering, cutting and embossing die cut hearts. I used black and white pearls for shirt and jacket buttons, added a couple of AB gems to the brides dress, I made a grosgrain ribbon dickie bow for the groom and finished off the card with gorgeous silver satin ribbon and a diamante ribbon slider. see you tomorrow with another wedding invitation.